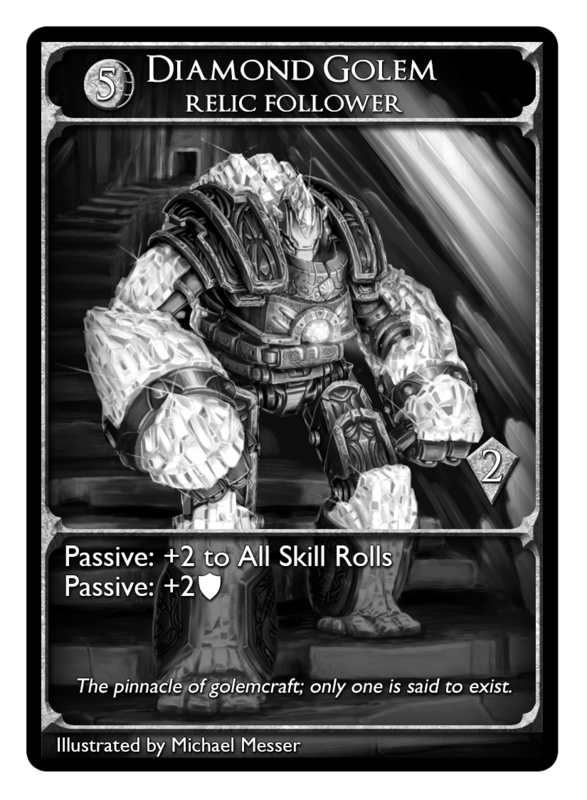 I just finished editing the latest card, Diamond Golem, illustrated by Mike Messer. Mike has contributed immensely to the on-going development of HeroCraft, and so I thought it would be fun to reveal his process (from my perspective!) and show the Diamond Golem's journey from concept to final card. Hope you enjoy! When I developed the original cards for HeroCraft, most started with a functional concept and could be skinned however I wanted. Some, however, were created with an aesthetic inexorably bound with their game mechanics. 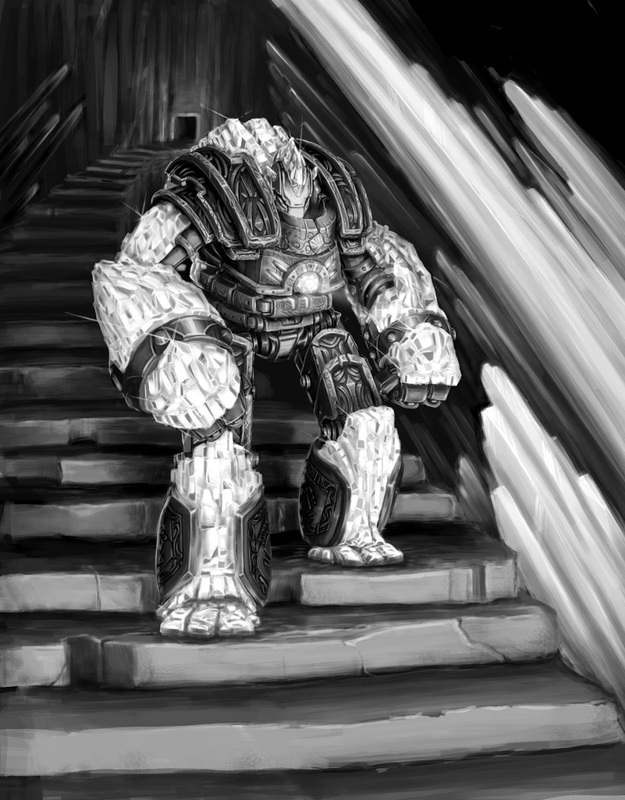 Since art production was a long ways off, I created a repository of reference images, notes, and written lore to accompany all of the cards. Fast forward three years later and I still reference this repository when I consign an art piece. Once the artist is chosen and briefed on the piece the journey begins. Mike's workflow involves creating some initial sketches to pitch. These can be as loose or refined as he needs to get the idea across when we next discuss. 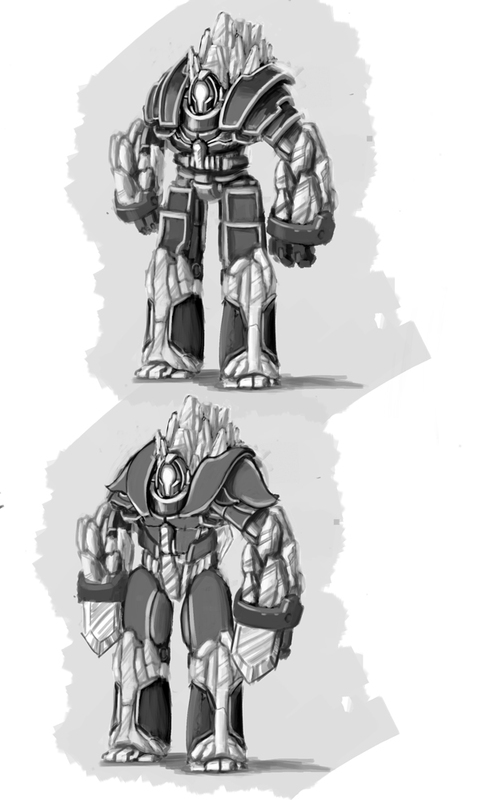 For the Diamond Golem, he sketched out a few ideas and emphasized his favorite with additional rendering (far left). After the first phase we discuss again and I approve the direction he's chosen for the artwork. 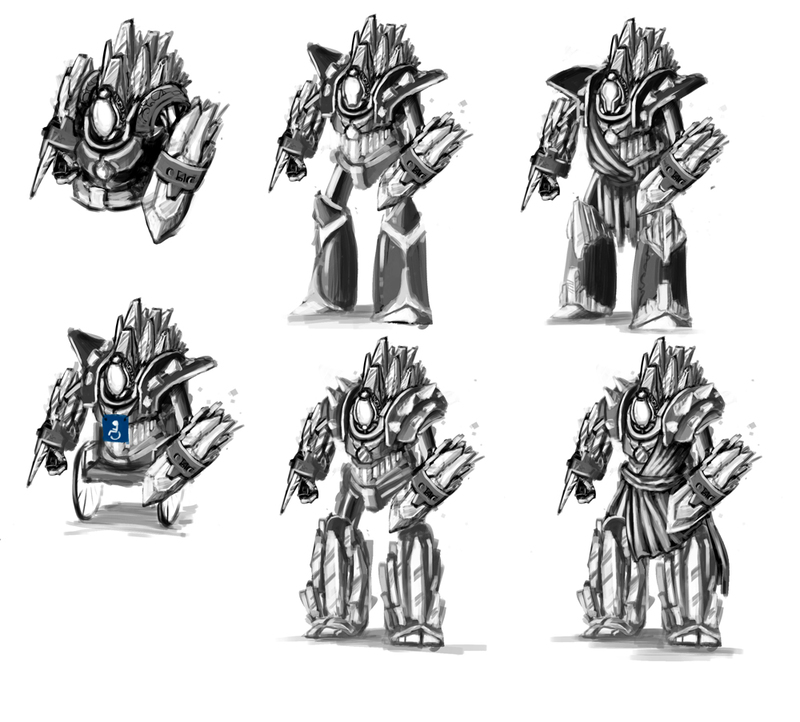 I give him feedback, such as adding legs, and he repeats the process with a focus on adding variation and refinement to the original idea. Working with Mike is great as he always adds some humor to the process. The length of this phase can vary as we're honing in on the overall desired look. After more feedback Mike gets the design that will (more-or-less) be taken to completion (right). In this particular instance I pulled a dirty move and told Mike I wanted a change in the head design. Being the good-sport that he is, he drafted tons of ideas. 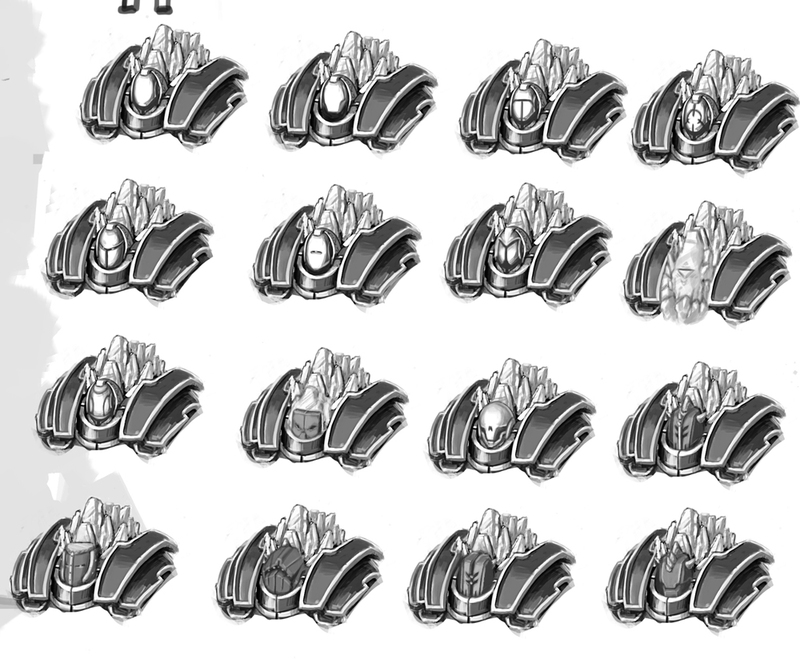 We settled on the bottom-right design. 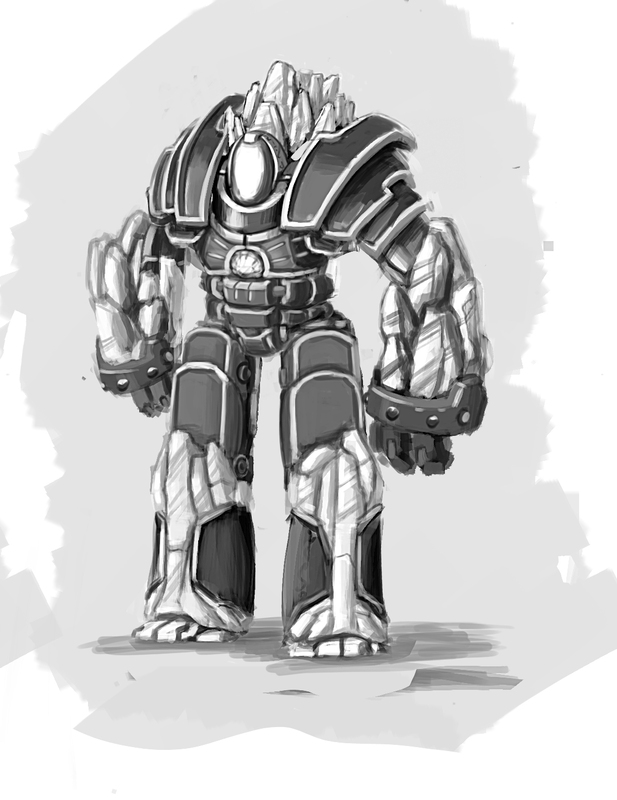 There were some additional last minute changes, such as reducing the golem's height and increasing his width to give a heftier silhouette like the other golems. With the design pretty much nailed down, we discuss pose and background. Mike calls the shots with the pose unless there's a specific criteria, and I give him some general (read: vague) ideas on the background scenery. 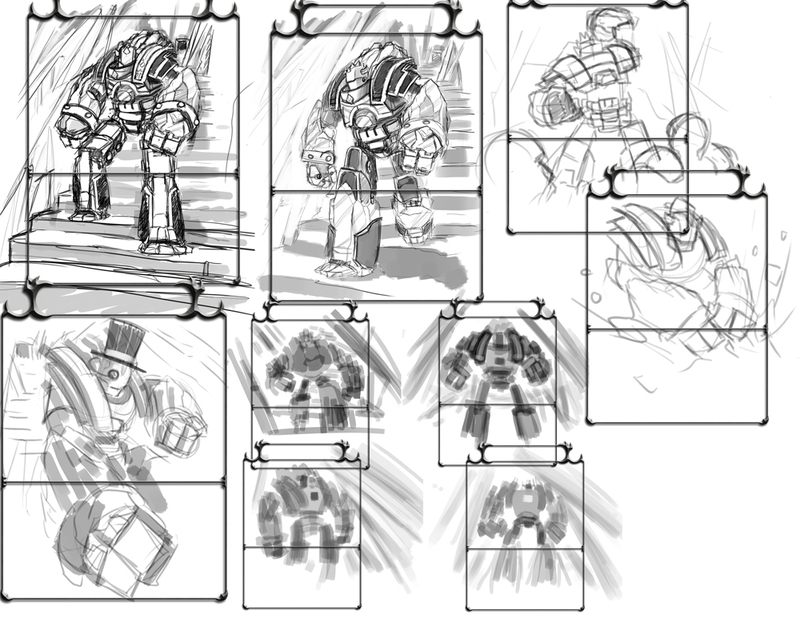 He uses a template frame to sketch some poses and dial in the composition. 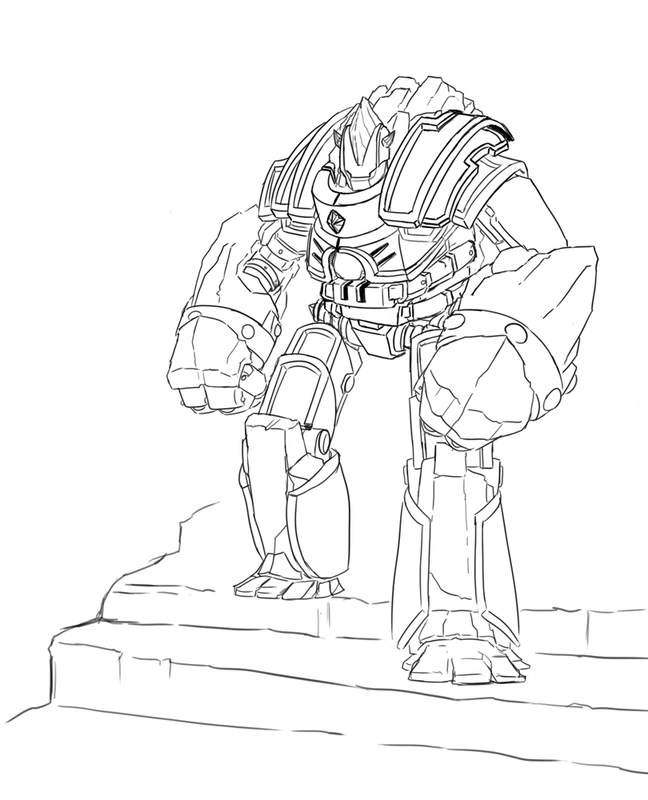 An outline is drawn showing the final piece as it will look on the card. I give it the approval and Mike begins the final and most exciting part. He then does what he does best by adding value, lighting, and details. Progress shots are sent to ensure that everything is moving in the right direction, but rarely is there further input from by me. The background is blocked in and rendered last, along with some tweaks to other areas. Mike sends me an email saying the piece is finished and I may or may not do a jig. I take the final piece into Photoshop and place it into the card template. Some minor adjustments may take place, such as cropping, levels, etc. Voila! A finished card, ready to join the others and await the day when they'll be printed. I hope you enjoyed this little inside peek of the art of HeroCraft. 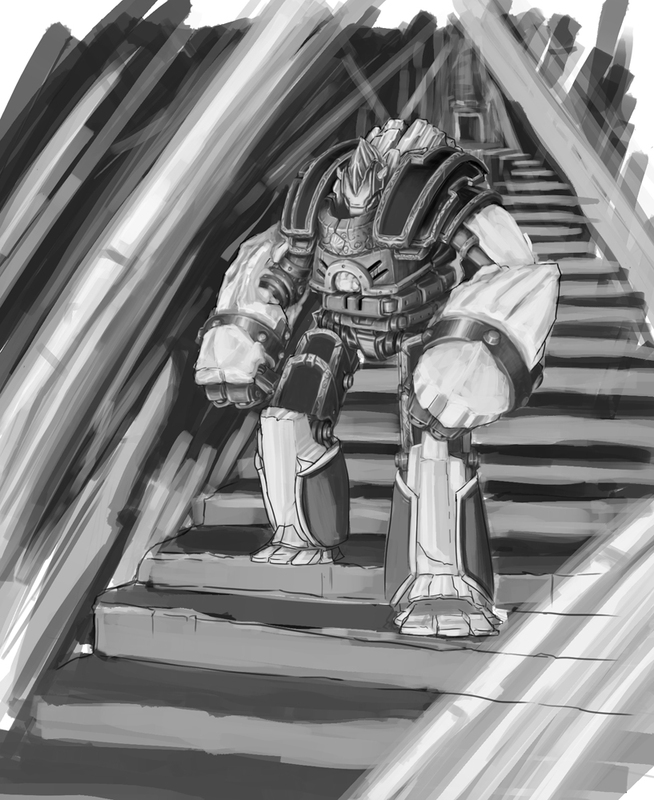 One of the goals for the Kickstarter campaign is to include a digital ebook version of an "art book" as a reward tier, featuring all of the art from the game with progress shots, story snippets, and other fun things. Lastly, a big shout out to Mike for creating such great art!